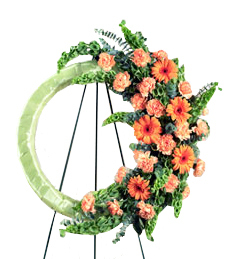 Energizing shades of green and orange brighten the moment in difficult times for that special someone. My Heart Wrapped in Satin is just what the occasion calls for. 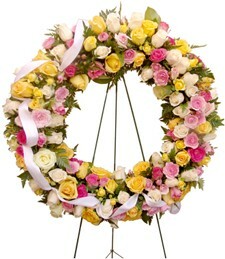 Take these precious blooms and wrap them around that loved one in grief knowing that time heals all wounds. 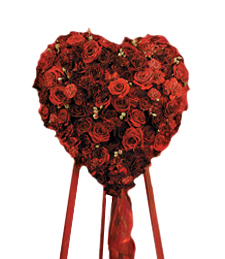 Show your heart with a show of theirs with a gift of love in a heart-shaped standing spray delicately designed in the ultimate colors of love, red, pink, peach, purple, and orange blossoms. Stand next to that loved on in a time of need and heal their heart with a piece of yours. 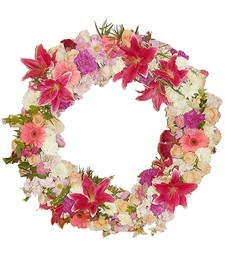 A meloncholy time for that special someone you care about is justified when Enchanting Blossoms Funeral Wreath enter their life and take them back to a place of safety. 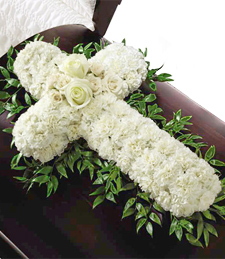 The warmth from a guardian angel ease ther pain of loss with a simple thought of empathy. 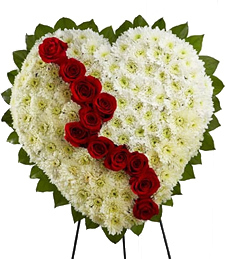 Hearts are afire for these assorted rosey blooms that were meant to sooth the grief of a loved one. 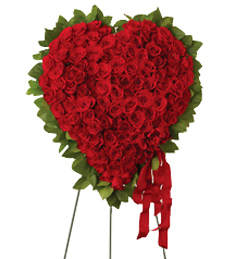 Cheer them up with a plethora of bright colored roses that relay a message of thoughfulness and empathy. 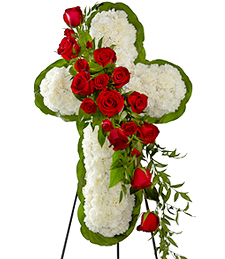 The grace, and delicateness of these captivating blooms will uplift grieving friends and relatives. Various shades of pink are a symbol of gentility and understanding during difficult times. 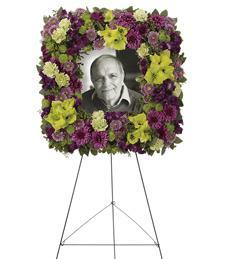 Send this unique arrangement as a testament of your original taste, and heartfelt condolences. 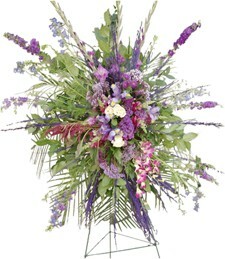 A bit of style and class of lavender, blue, and pink blooms send a thought of cheer in trying times. 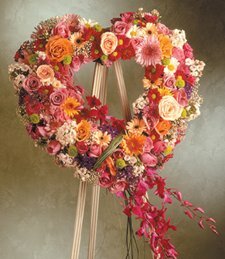 Remember their grace, style, and eternal love forever with a Highlights of Heaven Standing Wreath with a picture perfect snapshot of their essence. 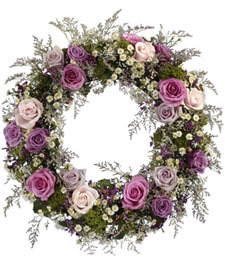 Brilliant exotic blossoms in the ideal shades of mystic purple, luscious lavender, and earthy green make a match made in heaven for that memorable occasion. 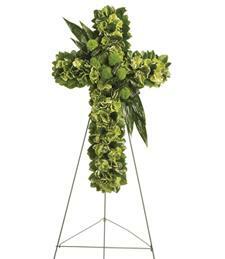 Stand by that special loved one in grief with an Invigorating Moments Cross Wreath embellished in deep hues of greens blossoms. Give the gift from the heavens above to highlight that special occasion and remember it for life. 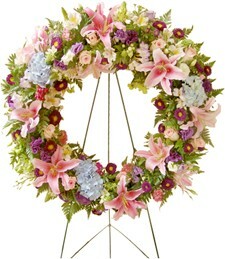 A gentle Cross My Heart Sympathy Wreath symbolizes truth, love, and peace with a air of dashing elegance. Ease their troubles with that unforgettable gift of unconditional love that leaves a lifetime of precious memories. There is nothing more profound than a gift from the heart. 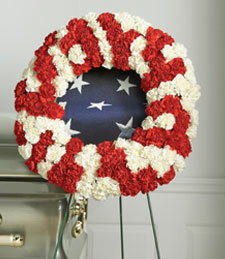 A Heartfelt Standing Wreath mirror the kind of unconditional love that lasts for eternity and beyond. All white aromatic florals shimmer and shine like a light from the heaven s above. Guide them with you Open Heart of Love into a state of ultimate spiritual healing. Luxurious shimmering fresh florals in the perfect hues of red and white set that delicate occasion right. Picture that enchanting state of zen for peace and serenity is just around the corner. Open your heart wide for a loving soul is the surest path to spiritual healing of that grieving loved one. 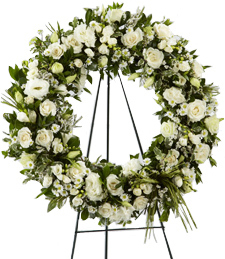 A White Hearts Above Sympathy Wreath is the utlimate luxury for that delicate occasion. 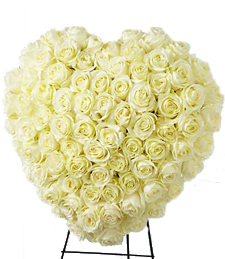 All white velvety roses stand together in perfect harmony for the garden of healing is most scared path. Be embraced the slighest gesture of Gentle Kisses. 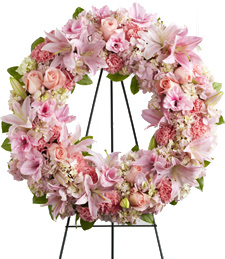 Luscious pink floral fill the room with happiness, joy, and affections for that special someone in grief. Let the most gentle touch be their journey down the path of healing.